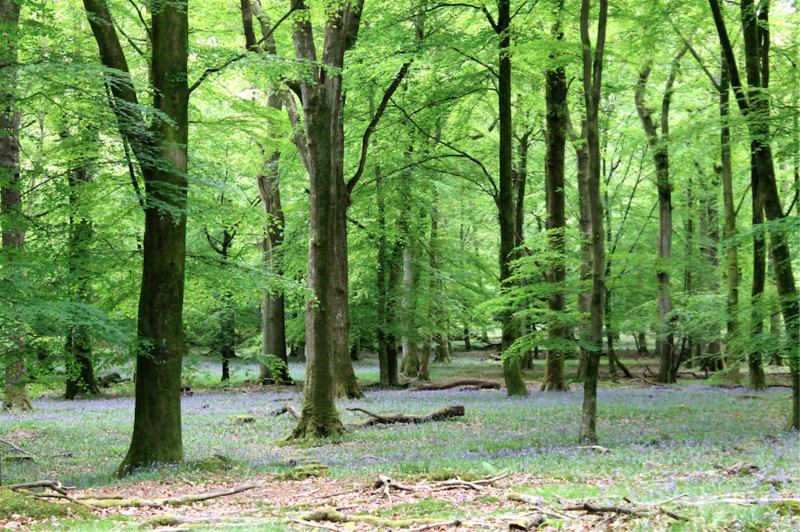 The bluebells that carpet the woodlands are a popular sight with visitors to the New Forest. I was pleased to see that British astronaut, Major Tim Peake, had posted images of the south coast from the International Space Station, circling 404km (251miles) above the Earth. It clearly showed the area of the New Forest and the great swathes of the undeveloped landscape that make up its diverse and precious habitats. For those of us with a more terrestrial view the New Forest is springing to life at the moment. The colours of lush greens, from the grasses and emerging foliage of the trees, mix with the cool blues of the bluebells in the woods. The bluebells that carpet the woodlands signal the time that fox cubs emerge from their dens to explore above ground. These beautiful spring flowers are a popular sight with visitors to the New Forest too. The plentiful sunshine of late is beginning to warm up the soil and more insects are taking to the air. This is good news for the birds that are rearing and feeding their young. There are currently plenty of foals to be seen on the heathland and in the woods, which make this time of year one of the highpoints in the Forest’s calendar. As new-borns they stay close to their mothers and rely on her presence to give them confidence. Their awkward, leggy movements and close shadowing of their dam is quickly replaced by a gambling, playful action as they begin to make friends and investigate the features within their territories. Watching foals at play has got to be one of the best stress-busters around, particularly if it takes place on a sunny day. The foals seem to exhibit a sense of fun and carefree exuberance that lifts one’s spirits. When they play together the results are often comical. They seem to like galloping as fast as they can around the other herd members, who are usually quietly grazing whilst keeping an eye on their antics. It’s all practice of course, as they need to master the limbs that will carry them away from danger should the need arise. They also practice rearing, bucking, stopping and kicking out, which are also in the survival kit of the free-roaming, ‘wild’ pony. With the appearance of foals comes the official breeding season. The mares that have given birth will now be ready to receive the stallion again. On the New Forest this process is very carefully managed. Only approved stallions are permitted to roam on the New Forest and this year 15 are to be released to run with the mares. Each licensed stallion will be freed to run with the mares in a specific area of the Forest from 9th May until 6th June. All stallions must be off the Forest by 13th June. In that time nature will take its course and the next crop of foals will be conceived ready for next year. Of course while the stallions are at large the atmosphere on the Forest becomes electric, as the mares realise there’s a stallion about – it becomes the stallion-silly-season. Visitors and commuters using the Forest roads need to be doubly aware for ponies crossing the roads during this time. When the stallions are at large the ponies only have one thing on their minds! 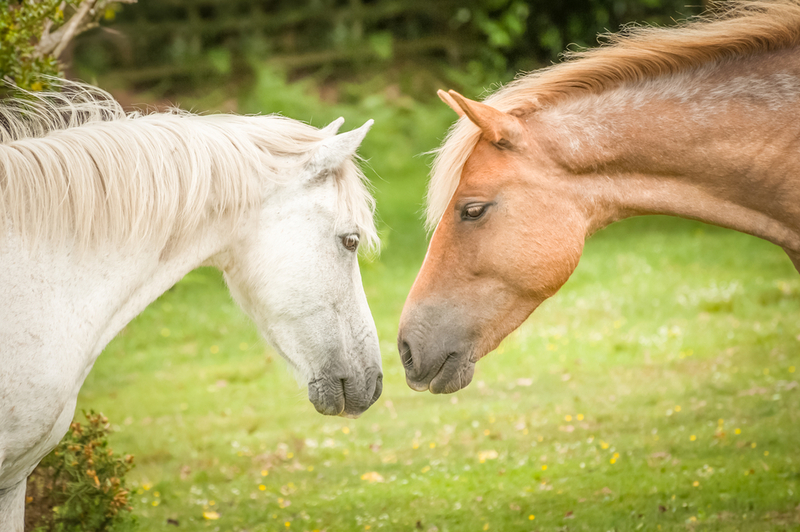 When the stallions are at large on the New Forest the wild pony herds exhibit much excitement. This entry was posted in New Forest, New Forest pony and tagged bluebells, foals, fox cubs, mares, New forest, silly season, stallions, trees. Bookmark the permalink.